I first have to apologize for the lapse in postings on this blog. It has been a crazy few months, and time seems to be flying. I have been busy with the end of classes, and the end of work, and the end of living in St. Louis. Many of you may know, but I will be leaving at the beginning of June to begin a new phase of my life. I will first spend two months volunteering with an organization called Save the Children in Swaziland, Africa, and then I will be heading to New Orleans to begin a degree in International Health and Development (Public Health, essentially) at Tulane University. If you happen to be interested in what I will be doing in Africa, you can visit www.clairetoafrica.com to read my Swaziland blog while I am away (and you can help sponsor me, too, if you so choose!). So, while there may be a slight hiatus on the blog, I will be back in the fall with new recipes! In any case, with the flurry of preparations for moving out of my apartment, getting ready to head to Africa, finding a place in New Orleans, and the other hundred things I feel like I have to do before June 1, it's been difficult to find time to cook anything, much less be creative in the kitchen. But I can sense that it's been too long for me, and I desperately need a day to myself where I can relax and bake all day, humming along to some good music. While I might not get a whole day to do that anytime soon, I took advantage of a small pocket of time today to try out a new dish, one that is a little spicy and very satisfying in its flavor. You could just as easily make this with some good brown and wild rice, if you would prefer, but I was in the mood for some hearty quinoa and decided to go with that instead. Place the quinoa in a pot with the 2 cups of broth and bring to a boil. Add 1 tbsp. ground coriander and 1 tbsp. tomato paste, stir well, and bring to a boil again. Cover, reduce heat, and steam as directed for about 15 minutes. In another pan, place the oil, onion and garlic, and saute for about 3-5 minutes until onions are translucent. Add the chopped red and green pepper, salt, pepper, 2 tbsp. 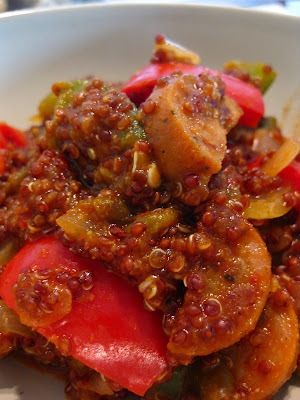 coriander, cumin, cayenne pepper, and the can of fire-roasted green chilies and stir well. Continue to saute for another 3 minutes or so, and then add 2 - 4 tbsp. tomato paste. Cook over medium-low heat for another 5 minutes. Slice the two links of sausage and arrange in a skillet. Fry over medium-high heat for about 6 - 8 minutes, then remove from heat and set aside. 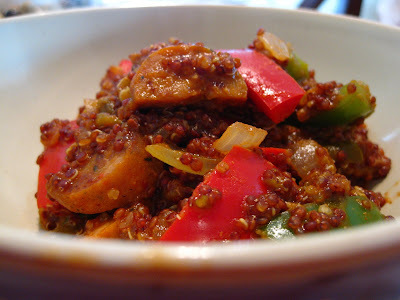 Once all parts are done, add the onion-pepper mixture and the cooked sausage into the cooked quinoa and mix well. Add more seasonings to taste if desired. Tastes even better the second and third days!